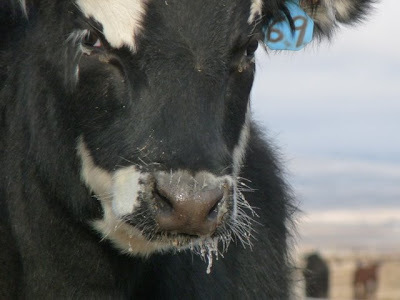 I was hangin' out with the cows the other day and decided to take a closer look at them. 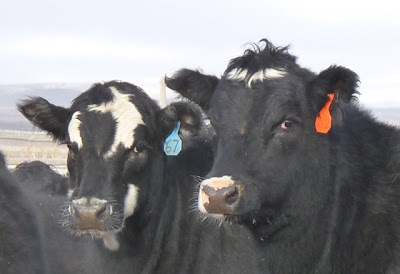 Which one would be my model cow? -a cow not afraid to grace my blog. A couple early contenders are shown in the picture above, but they didn't stick around, so I had to search for another cow to be my model. I looked and looked, and then I found her. 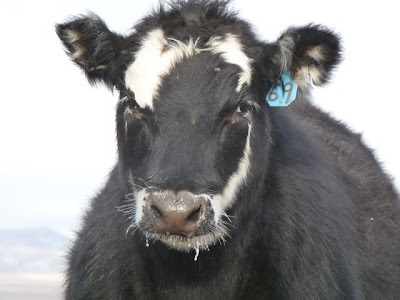 Number 69, with broad shoulders, a shapely figure, wide set eyes, a pierced ear, interesting facial striping, a warm nose, and to top it all off, a little frozen drool on her whiskers. How could I resist? Number 69 struck a pose, and I snapped away. The Brooding Look. The Don't Mess with Me Look. Yikes, here's number 142 trying to steal away the attention with a come hither expression as she wags her tongue. But I won't sway, I'm back to Number 69, with that drool dripping down further. She prefers being photographed from this side. It makes her eyelashes look longer. 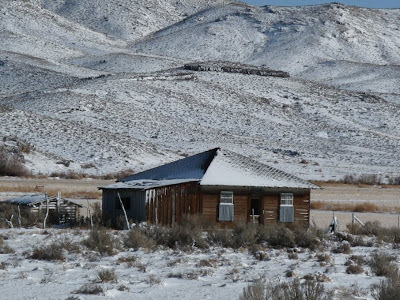 There's something about a coating of snow that makes everything look old romantic, even an old, abandoned homestead like this one. 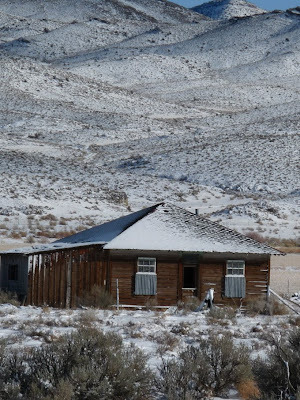 We have a number of abandoned houses in the area, mainly due to a change in the culture. In 1900, about 39 percent of the American population was involved in agriculture. In 1945, that number had fallen to about 17 percent. 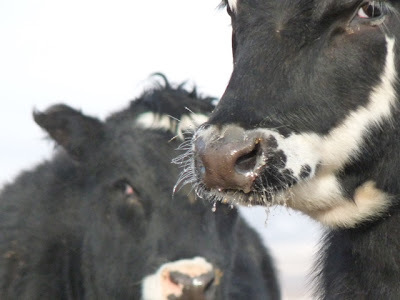 In 2000, only one percent of the American population farmed. 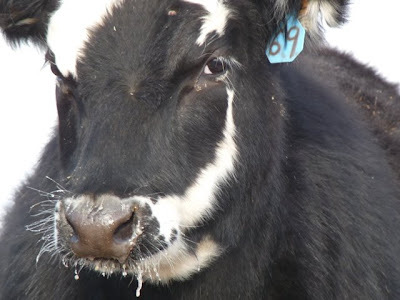 This dramatic decrease in the farming population is mirrored by a decrease in the rural population, from 60 percent in 1900 to 21 percent in 2000. Although this huge transformation meant many people left rural areas for urban and suburban abodes, many of their homes were left behind. Over time I'll feature some of these abandoned buildings and look at some of the architectural styles of them. This particular style is common around here, a square house with a door in the middle of the front. It usually had a living room, dining room/kitchen, and two bedrooms. Running water was not available when the house was built, so an outhouse is out back. Many houses of this type have an addition in the back or on the side for a bathroom and more modern kitchen. 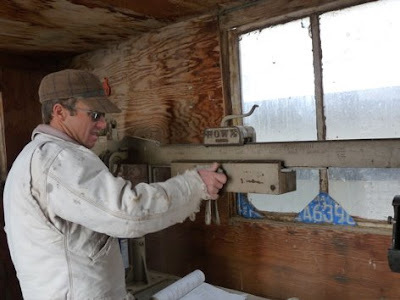 Because refrigeration also was not available, a root cellar is nearby, along with assorted outbuildings. It's fun to imagine what life was like in these old buildings when they were occupied by vibrant families busy with their day-to-day activities. 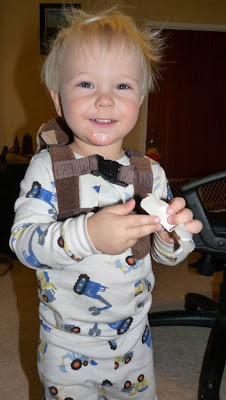 I like to have light-hearted posts on Sunday reflecting family fun, and Desert Boy sure cooperated this time. He's developing more of a fashion sense, despite his flyaway hair. 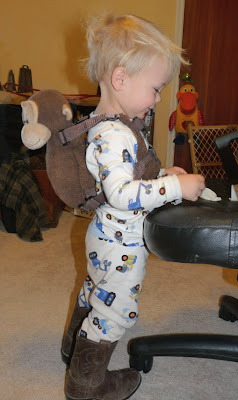 He pulled on some cowboy boots and wanted his "monkey on his back" put on. 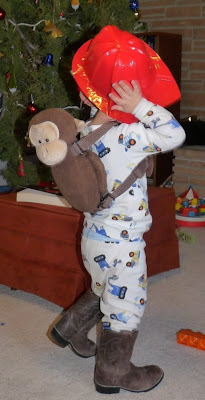 But something was missing, and he went in search of it--his hat. 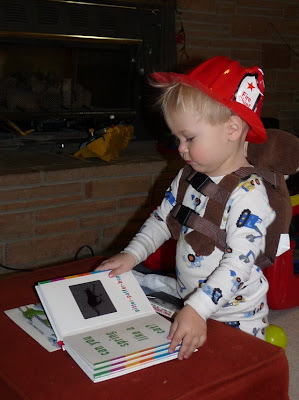 This isn't any old hat, it's his Fire Chief hat. I mean, what else would you want to wear with your glow-in-the dark backhoe pajamas, cowboy boots, and monkey leash? He was totally confident in his fashion statement. He even modeled the back so we could get the full effect. And then it was time to get to work in his outfit--reading. What a good boy. I noticed a flash of blue out the living room window yesterday morning and found a bright pinyon jay livening up the evergreen foliage. Pinyon jays usually travel in flocks, and sure enough, as I watched I saw many more pinyon jays. These flocks can consist of up to 500 pinyon jays, and many jays stay in the same flocks for their entire lives. 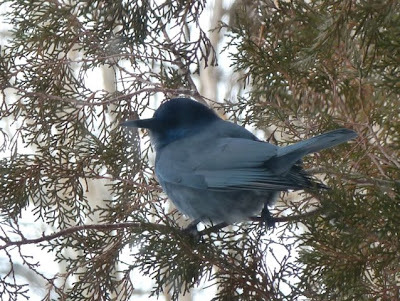 Pinyon jays are only found in the western United States. 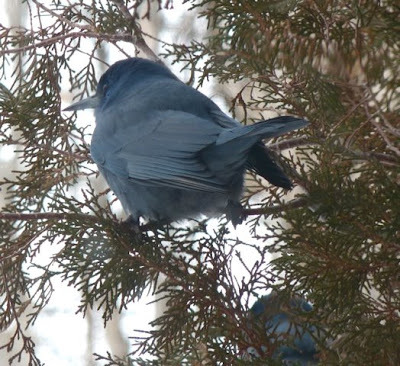 These social birds eat pine seeds, and they don't have any feathers at the base of their bills. This enables them to poke their bills deep into pine cones and not get any annoying sap on themselves. 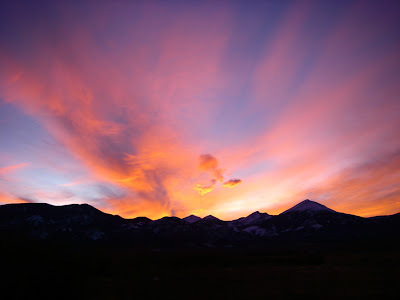 Each pinyon jay collects thousands of pine seeds each year, caching and remembering where they are for later months. They have such good memories they can even find the seeds under snow. If only I could remember where I put things around the house! 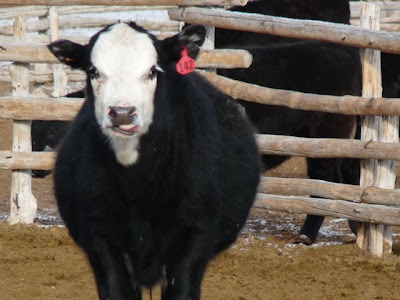 It's that time of year to weigh the calves and see if they've put on enough weight. 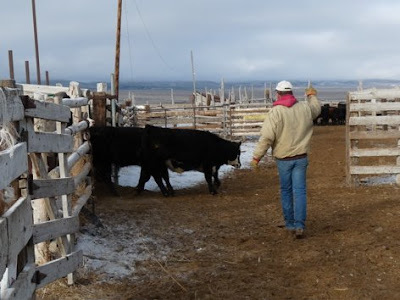 Our ranch raises calves until they're about 850 pounds, and then they're sold to a buyer who will finish them, or raise them until they're between 1,200 and 1,300 pounds. Because we live in such an isolated area, it's not economically feasible to finish and ship cows from here. 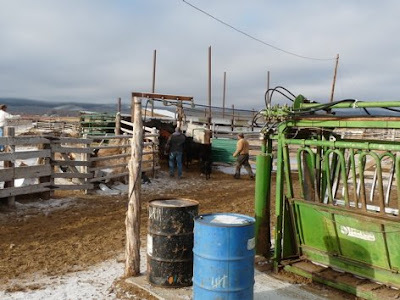 First the cowboys gathered up the calves and herded them into holding pens. Then about 50 at a time were send to the scale. 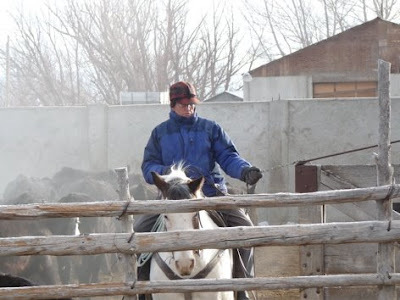 Here's our oldest cowboy, Lee, working on the frigid morning. 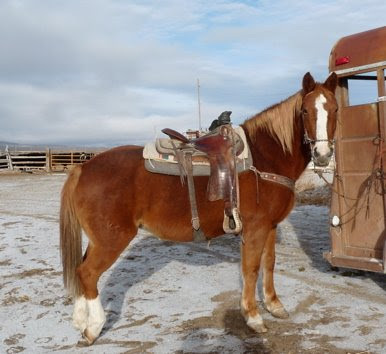 Not even cold weather keeps him away from rolling out of bed at 89 years and getting his horse ready to work calves. And here's my sweet-faced nephew Ryan holding the gate open. He probably wouldn't like me calling him sweet-faced, seeing as how he's a college man now. 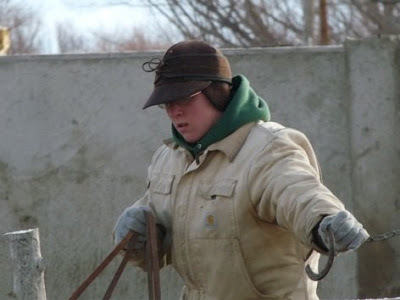 You can see it's cold by all the layers he's wearing, including his thick green hoodie, work jacket, and warm wool cap with ear flaps. Those ear flaps are really nice, they keep your ears nice and cozy. The calves run past my hiding spot and towards the scale. The cowboys make sure none run in a different direction. The scale is huge, it weighs semis with trailers full of hay. 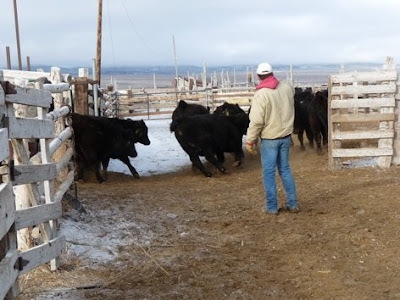 Once all the calves are on the scale, they close the gate. 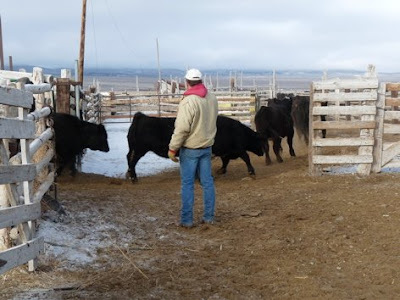 Then my brother-in-law Dave goes into the scale house to weigh the load of calves. 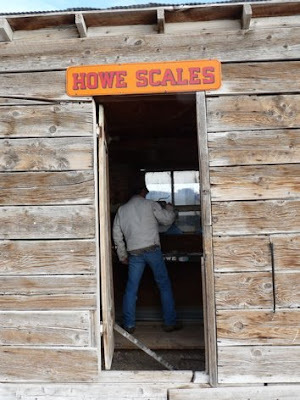 It's an old Howe scale, 1930s vintage, and it still works great today. The state Scales and Measures comes out and inspects it every year. 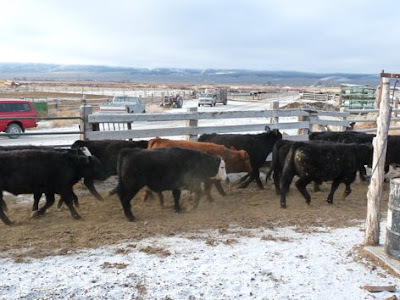 Once a few calves lead the way, the rest are ready to follow. 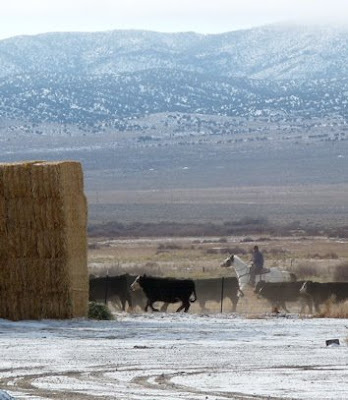 He's carefully counting as they go by, as are other cowboys. 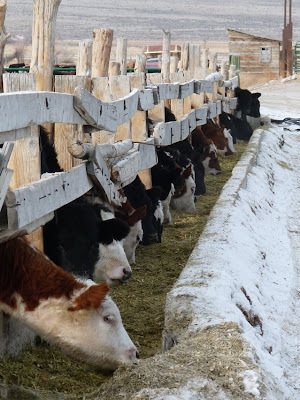 It's important to know how many calves are in each load so the total weight can be divided by the number of calves, and the average weight per calf calculated. On this particular day, the average weight was about 800 pounds. 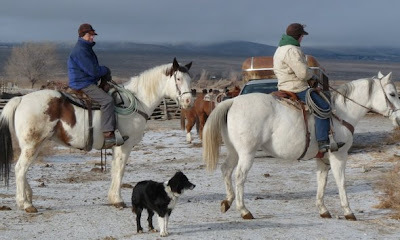 Here's Kate, ready for the weighing to conclude so she can help move the calves back to the area they came from. 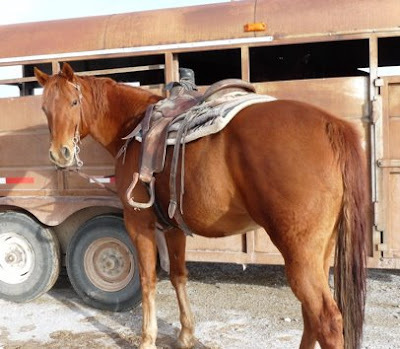 This horse was particularly friendly and let Desert Boy pet her quite a bit. 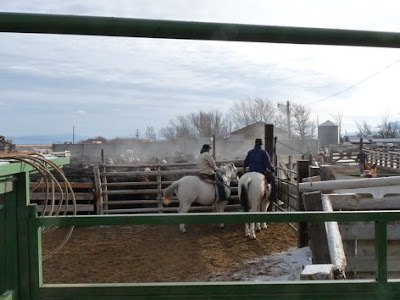 After the last load of calves has been weighed, Lee and Ryan come out, along with border collie Heidi, and they are all ready to move calves. My husband told me in advance where the next good camera angle would be, so Desert Boy and I started walking in that direction. 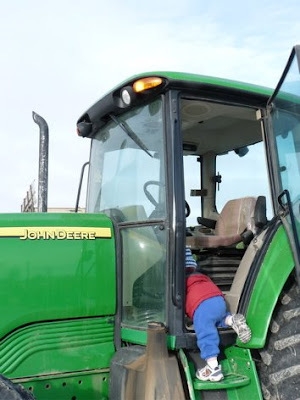 Only Desert Boy found a distraction and took off at a run towards this John Deere tractor. 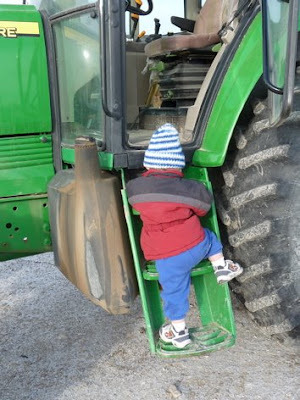 I don't help him climb up--I figure if he wants to get in the tractor bad enough, he'll figure out a way. And he did. 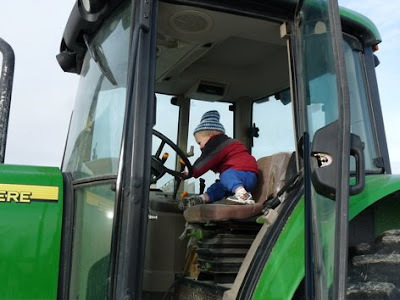 Getting up on the driver's seat was a little tough, but he was determined. What are you looking at, Mom? 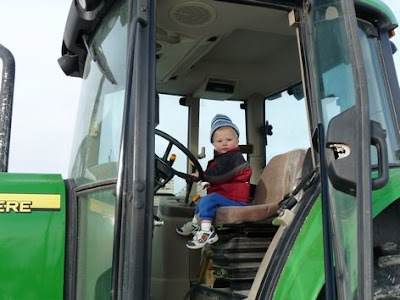 Of course I can drive this big tractor even though my feet don't reach the pedals and I'm really bad at steering. 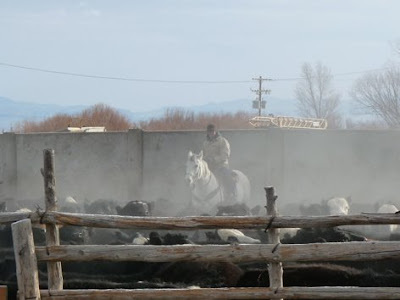 Our little detour didn't let me get in a great spot for photos, but I did manage this one with Lee herding the calves on the other side of the equipment yard fence. 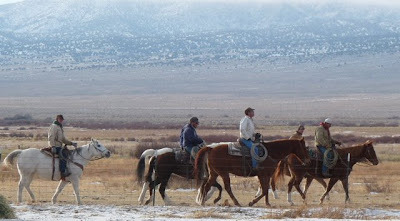 And a few minutes later, all the cowboys were heading back to the trucks, mission accomplished. 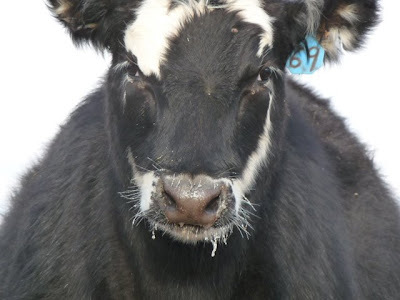 They know the calves need to eat for a few more weeks before they'll be leaving us. At this stage, they're gaining about four to five pounds a day. I mean the calves, not the cowboys, although hopefully they all had big holiday dinners! Hope you have a wonderful day full of good cheer, good company, and plenty of good food! 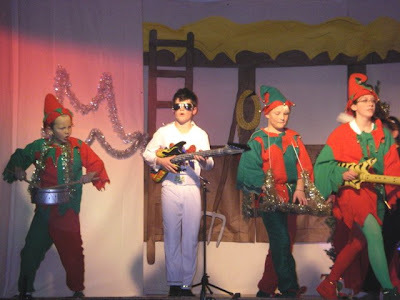 Every year the local schools put on a Christmas program, and two nights ago was the special occasion. Desert Boy was calmest when we sat right up front so he could see all the action. He wanted to go up on stage, but fortunately he didn't quite make it. He also spent some time between acts wandering around and visiting people. 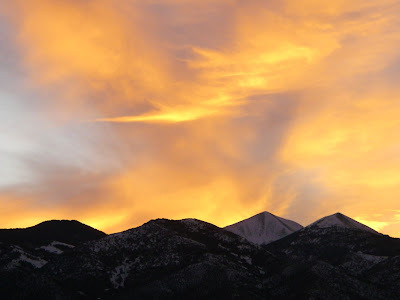 One of the nice things about living in such a small community is we didn't have to worry about him--we knew just about everyone there, and they knew him. After that, the K-2 class put on a really cute play, Christmas at Old McDonald's Farm. Each student was an animal and had a few lines, including getting to make their animal's sound. Everyone enjoyed it. Then it was time for the play from grades 3-6. The play started with the magical appearance of Elfis at the back of the hall. 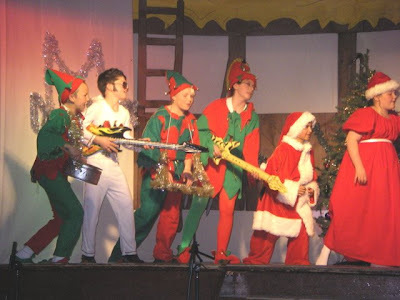 Before long Elfis was rocking up on stage with Mrs. Claus, some reindeer, and elves. The kids really got into the music--just look at their expressions. They didn't seem to be at all shy to be performing in front of 200 people. I think because they perform every year from the time they're kindergartners, they just take it for granted. Hopefully they'll keep that skill of being able to talk in front of a crowd for the rest of their lives! The costumes and choreography were great. 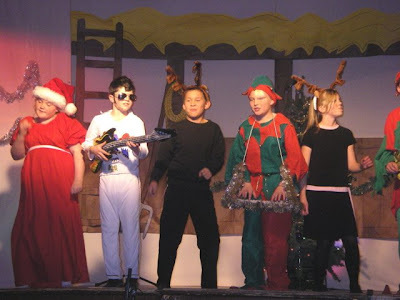 The play helped us all get into the Christmas mood. When the lights came back on, refreshments were served in the back of the hall. And then another special guest arrived: Santa Claus! 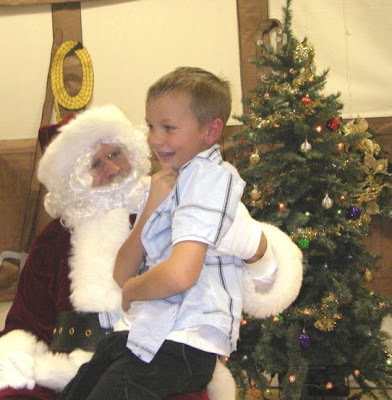 Here's my nephew, Tractor Buddy, up on Santa's lap. He wanted some big things for Christmas. 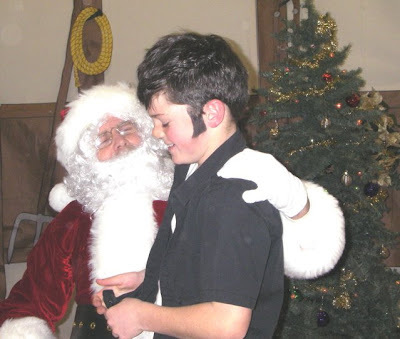 Even Elvis took a turn, sideburns and all. I was hoping Desert Boy would pose for a picture on Santa's lap, but it had gotten a little too late for him, and he dove into my arms. Maybe next year. The kids were so excited to tell Santa what they wanted---and they were probably eager to get their bag with candy cane and orange, too! 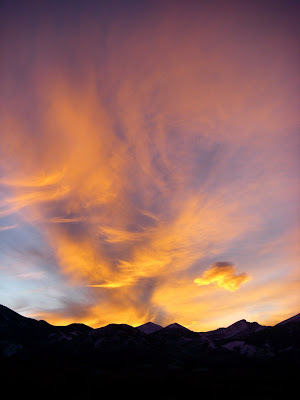 The evenings are long in December, and we have to look for ways to entertain ourselves. It helps with college break. My nephew brought home Rock Band, a game where a drummer, singer, and two guitars try to mimic a song that is played on the TV. It turns out it is really, really addictive. Even if you're bad. Really bad. 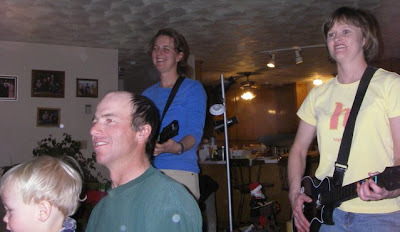 After we kicked the kids off it, we spent a couple hours and were glad when we could get 43 percent of a song finished. 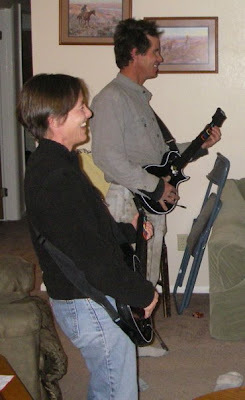 Here's my husband and his sister rockin' out. I had to give it a try, and it is fun. 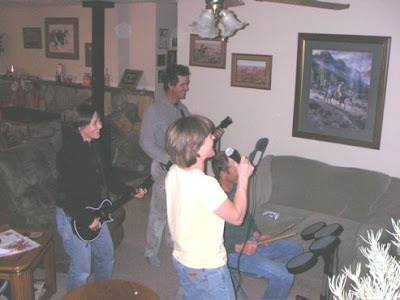 I'm standing with the guitar on the left in the blue shirt, while my sister-in-law is on the other guitar and my brother-in-law is on the drums. Desert Boy couldn't resist helping us out. He's quite a crooner. I'm glad they didn't have this game when I was in college, it might have been hard to get my homework done. Now if I can only sneak over to my sister-in-law's house and get some practice time in, maybe I can get to 63 percent.